What Did I Learn From Google Satellite Maps? Plenty has been said and written (mostly technical reviews) about the new Google Maps and their latest feature - satellite images (Directions had a few things to say, too: 1, 2). A lot of my colleagues watched with trepidation as millions of office workers worldwide checked out Hugh Hefner's mansion and productivity dropped to Superbowl Monday lows. "What is that going to do to our industry?" was a common discussion topic around the water cooler. 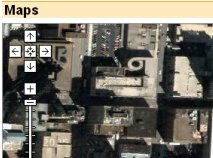 After observing how my friends, family and other non-GIS folk reacted to the phenomenon, I can announce that for me the release of Google Maps Satellite meant three things. My friends can finally relate to what I do. Sophistication is important, but don't neglect the colors. Who hasn't been through that question - having to explain to a stranger, simply, in one sentence, what you do.In my 14 years in the industry, I have always dreaded the question.Until last week.Now I say: "I sort of do what Google Satellite" does.And everyone understands.At a party a few nights ago we had a lively discussion about GIS.I didn't even start it. What do you mean; the world doesn't revolve around GIS? An interesting uptake on Google's satellite images are the "memory maps" that have caught on like wildfire on websites like the photo-sharing site Flickr.Memory Maps groups form spontaneously.Hundreds of people have posted hundreds of memory maps, each map complete with meticulous annotations for dozens of features.The "memory maps" use Google's satellite imagery, over which users mark locations of events that were important in their lives.First house, first school, first kiss, it's all there.All of a sudden satellite imagery has become the foundation of a cultural phenomenon.Who would have thought it would have such broad appeal to such a broad audience? But then who would have thought that the world doesn't revolve around GIS? My son is 14 and he likes to play video games. His latest favorite is a hyper-realistic automobile racing game.I am amazed at the level of detail and the huge amount of effort that must have gone into rendering those cars at every possible angle, speed, etc.I think about the huge number of polygons that must have been created to generate that hyper-realistic car image.I am impressed.My son, on the other hand, takes the awesome 3-D rendering and meticulous car movement modeling for granted.But he is extremely impressed by his ability to change his headlight color at will with the push of a button - a completely unimportant (and very simple to code) feature, if you ask me. All of this made me think about the sometimes huge divide between our GIS applications' sophistication and the general public's impressionability.Or need. Last week I visited with a municipal client on the day after "Google Satellite" launched.I had previously assembled a comprehensive set of GIS data layers for the municipality, including a fresh (and free) set of 1:200 scale 1-ft.pixel resolution color infrared digital orthophotos.The first words out of my client's mouth were: "Did you see Google Satellite?" And then: "Can we use their aerials?" After a brief discussion it became apparent that for the client, the true color of the Google satellite images was more than offsetting the huge and apparent (to me) advantages of their current aerial photos.So guess what, now I am working on a color infrared to true color digital orthophoto conversion. In conclusion: Google Maps is good for GIS, at least for now.It makes it easy to explain what we do.The world doesn't revolve around GIS, but we knew that (did we? ).Sophisticated doesn't always equal impressive.And colors are very important.